Something strange occurred with Manchester United’s official Twitter account for Spanish speaking followers during the club’s derby encounter against City. The Red Devils went on to beat the league leaders in a sensational 3-2 win to give the fans memories of yesteryear blockbuster matches between the two sides. Paul Pogba’s brace in the second half led the charge before Chris Smalling sealed the tie with the winner in the 69th minute. But amidst all this, a mysterious tweet was posted regarding Real Madrid midfielder James Rodriguez in the first half, shortly after Ilkay Gundogan scored City’s second at the stroke of half-time. The tweet was then deleted during the half-time. It was a strange circumstance as to what the tweet could have meant. The Colombian international is currently on loan at Bayern Munich, and has played his part in a title-winning domestic campaign for the Bundesliga giants. He also sees himself in action in the 2nd leg quarter-finals against Sevilla on Wednesday. 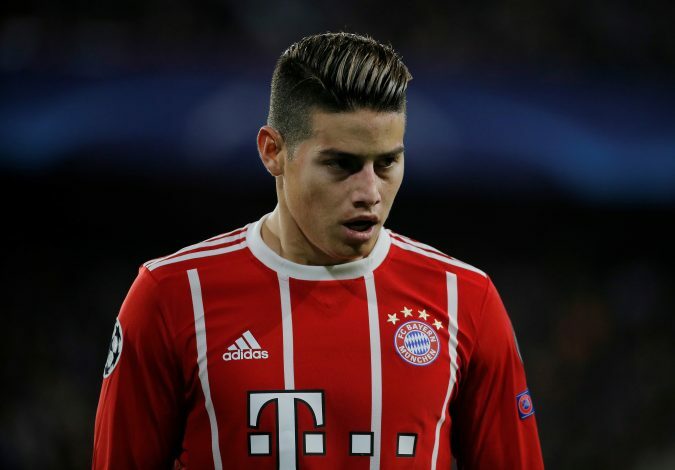 James was earlier linked with a move to Old Trafford, but he went to the Bavarian giants instead in a two-year loan deal. This, in turn, means that the player is also likely to spend next season at the German club. Jose Mourinho stated recently that he is not interested in signing an attacking player in the summer, after the arrival of Alexis Sanchez in January. So where does that leave Rodriguez and the English giants? Well, that’s for the fans to guess!